With BOB AND LARRY'S SUNDAY MORNING SONGS, Sunday mornings will never be the same! This great collection features traditional favorites, popular VeggieTunes selections, and some wacky new songs. Over 30 minutes of Bob, Larry and other Veggies singing along with their kid counterparts. This CD or cassette features 15 songs kids will know and love from Sunday morning, sung by Bob the Tomato, Larry the Cucumber, and a bunch of friends! 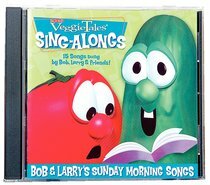 About "Bob & Larry's Sunday Morning Songs (Veggie Tales Music Series)"